From Hubbell Trading Post: Frederick Monsen was an American photographer who was born in 1865. Monsen was among the most prominent members of the Pasadena Eight, a group dedicated to preserving California history and compiling a record of the Indian tribes of the Southwest. He first visited the Southwest in 1894 and remained until 1895. Other members of the Pasadena Eight that worked in the Southwest with Monsen were Charles Lummis, Adam Clark Vroman, George Wharton James, and Carl Moon. Their commercial work sold widely, both at local tourist stops and eastern photography galleries, as well as to such popular national publications as Harper’s and Leslie’s Illustrated Weekly, which reproduced many southwestern images at the turn of the century. 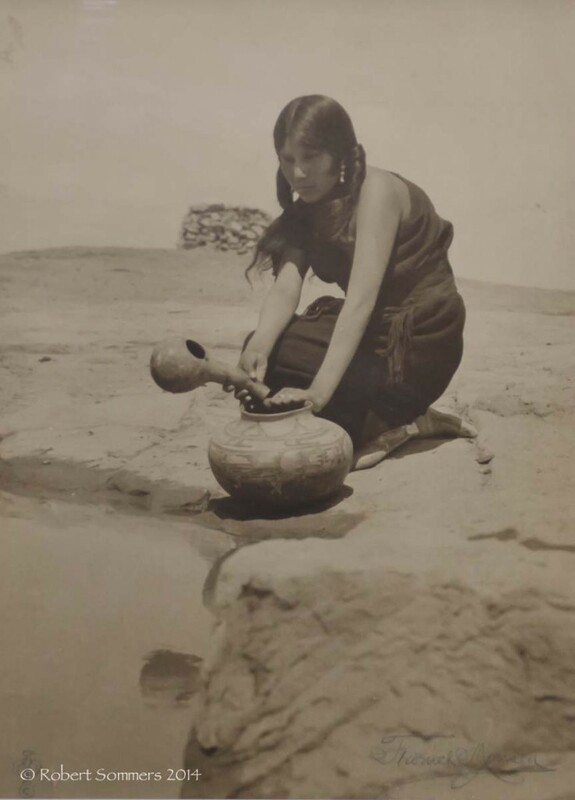 Trade journals reached a more limited audience but carried photographs of higher quality and articles that revealed an attitude toward Pueblo tribes reminiscent of that espoused by Cushing, Bandelier, and other scientists who were first inspired by the area. For the most part, the Pasadena Eight were dedicated to an objective and informed view of Pueblo life and profiling Pueblo tribes captured by their lenses. This perception closely paralleled that of the anthropologists, who by the turn of the century seemed to have considerable influence over the publicity that conditioned public attitudes toward Indian life in the Southwest. Monsen authored several books and articles during his career. In With a Kodak in the Land of the Navajo, he described Navajo and Hopi country as “a land of extinct volcanoes and shadowy canyons, a land of dead and forgotten people.” Martha Sandweiss writes, “In the work of photographers such as Monsen or Charles Lummis or Edward Curtis, the people and the land could be remythologized together and transported to a dim and shadowy past.” In the first third of the twentieth century, photographers such as Monsen, James, Lummis, Curtis and Laura Gilpin became photographer-authors, using the medium of the photographically illustrated book to shape viewers’ understanding of their pictures of the West.